Frost has come, putting an urgency in my days. Whoa, that sounds so dramatic, like maybe we’re homeless and shivering under the bridge instead of simply co-habitating with boxes of tomatoes, apples and a commune of fruit flies. It’s all a little funny right now – now that only 75 pears are exhaling ripeness into our house like small botanical alarm clocks; or how Dan and I are conducting high level negotiations about tomatillos; or how I have constant knife nicks in my fingertips (“Are you bleeding again, Mama?” The kids ask, barely looking up from their card game. 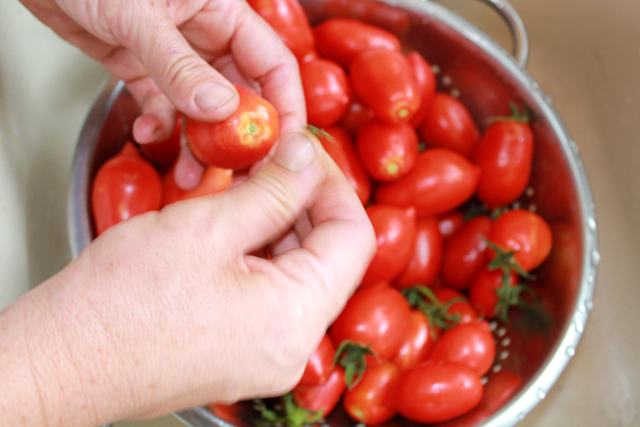 And then I wave my Edward Bandaidhands around at them); or how I made off with a box of my friend’s semi-ripe reject tomatoes that had sat through 2 nights of frost, laughing like a hungry raccoon all the way to…well, my own hot and cluttered kitchen. I know. The thing is I can’t not do this work of stuffing apples and tomatoes in jars. And though I can wave the banners of frugality, sustainability and local foods, my whole food preservation obsession springs less from any philosophy than from the irrepressible fingers of my very DNA reaching for a knife when presented with a basket of pears. (A friend recently asked if I learned to garden from growing up in Berkeley. Uh, no. I was too busy macking on some fat-free, synthesized food from a wrapper while searching out the next house party). 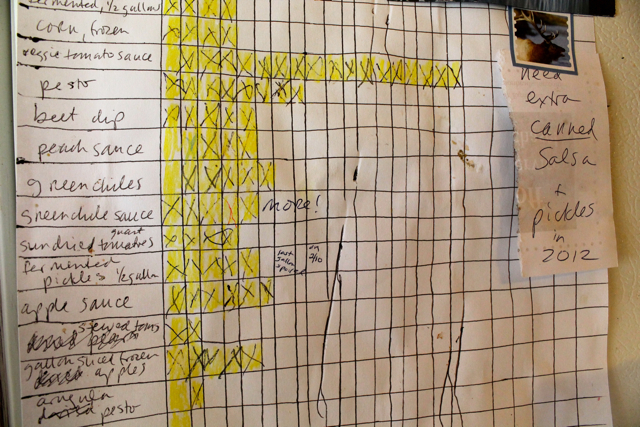 The 2011 food preservation chart: a helpful way to track what you made. It really is in my DNA. (Perhaps it’s in all of our DNA – y’know, that whole food preservation equals survival thing.) My grandfather, my Dad’s dad, who was an U.S. immigrant from the greek island, Rhodes, would spend much of his visits to my childhood home at our kitchen table, shelling California-grown walnuts to schlep back to Brooklyn. 1) Scout the neighborhood. Drive and bike around with an eye for fruit trees. Keep track of notable trees. 2) Tell friends you’re looking for fruit. But look what happens when they say YES! Dan and the kids picked these pears after simply knocking on a stranger’s door and getting the green light. The kids kept calling me and saying sadly, “we only picked a few shriveled pears.” “That’s okay honey, thanks for trying.” “Just TWO SHRIVELED PEARS,” Rose repeated three times, until I realized something fishy was going on. 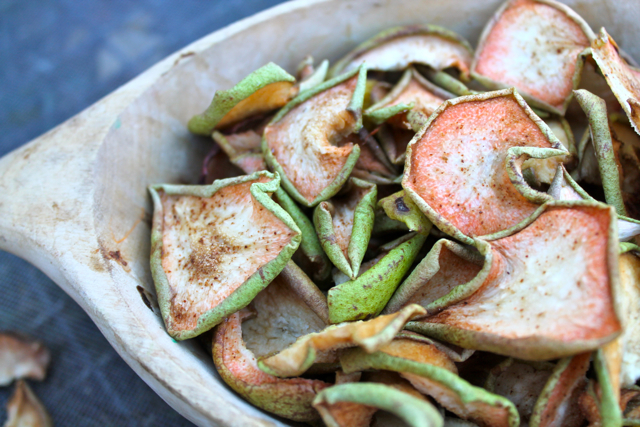 Our friend Jojo, (who recently told me he had access to three pear trees, and we both gawked like his stock portfolio was surging), came up with this recipe for dried spiced pears. These are the triumvirate of flavors: sweet, salty and spicy. 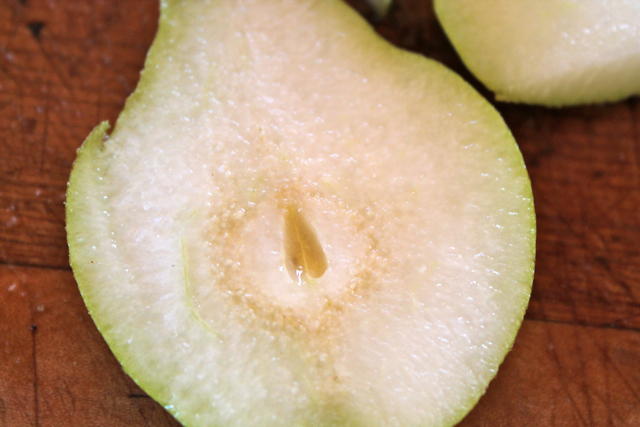 Slice pears. 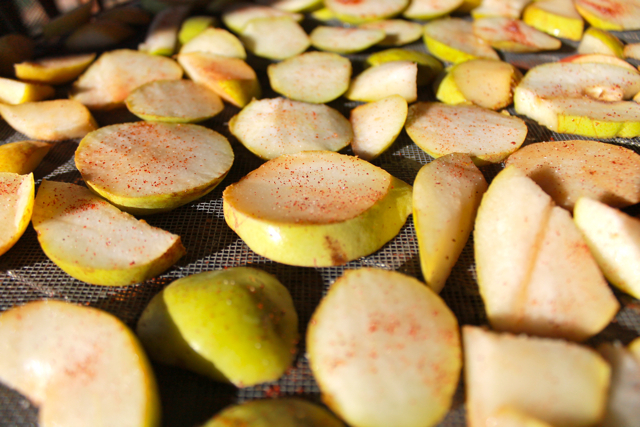 Sprinkle spice mix liberally on sliced pears. (some will fall off). *On drying fruit: we dry our fruit in the sun under screens, because our average humidity is around 20%. 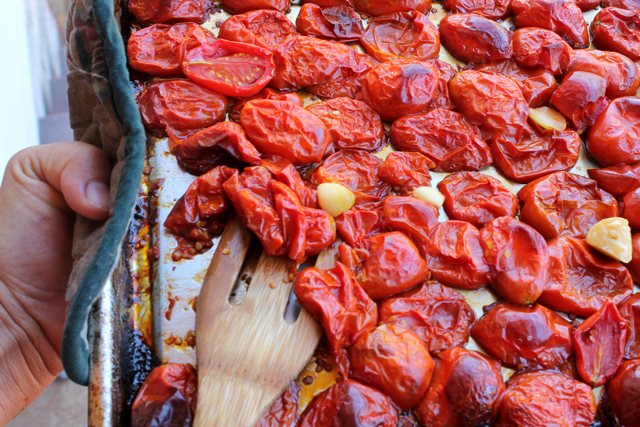 If you live in a moister climate and don’t have an electric food dryer, try oven drying. 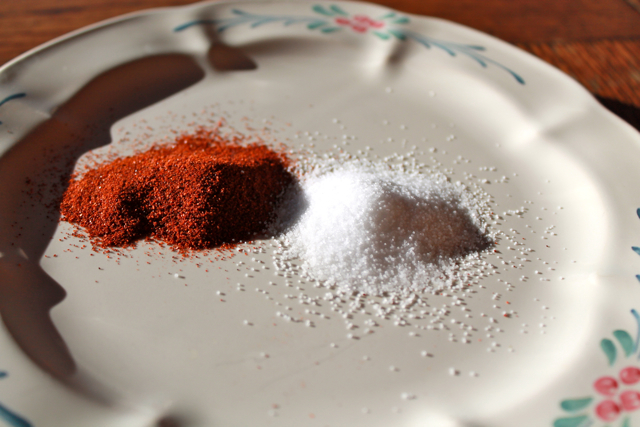 Red chile powder and salt. This is fun, except if you have multiple finger cuts. 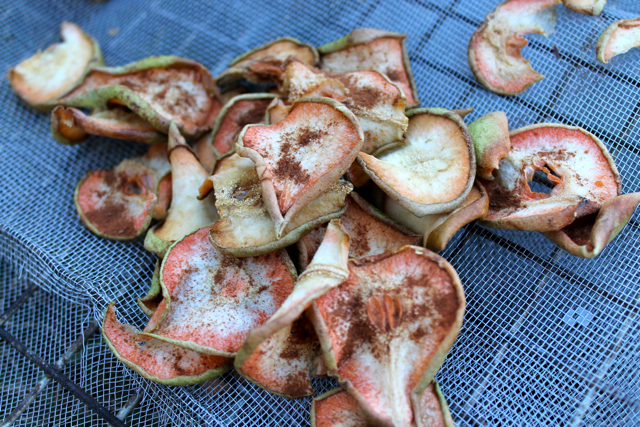 Slightly revolutionary: we did not cut the cores out, but as per Jojo’s instructions, sliced through the core, took out the seeds and dried the slices in tact. What do you see? I see deer hoof tracks. Just looking at these makes my mouth pucker a little, in a good way. 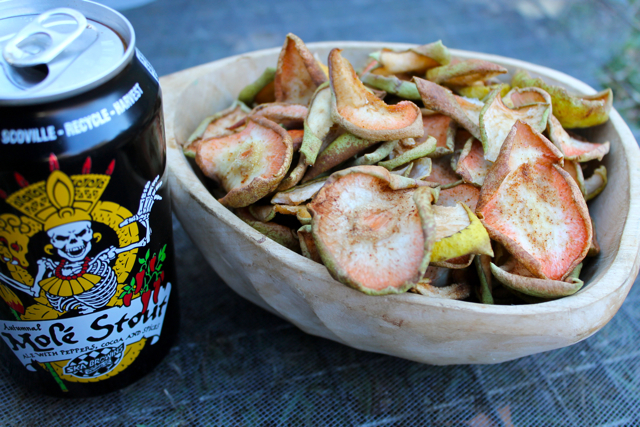 Speaking of sweet and spicy, have you tried Ska’s new Mole Stout (made with peppers, spices and cocoa)? It’s my new favorite thing at 5pm when the sun is already low and the children are tired-crazy. I go outside and drink my beer and pretend to garden but really just stand around taking in the shift in season. 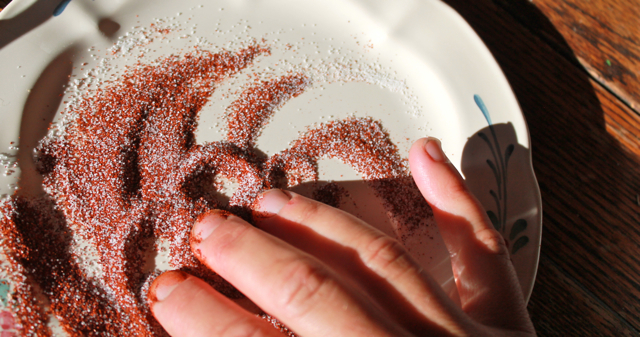 We also made a batch of cinnamon-salt pears. May your life be sweet, salty and spicy! 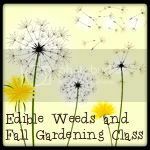 Linking up with Simple Lives Thursday. Also, gratuitous picture of Rose. 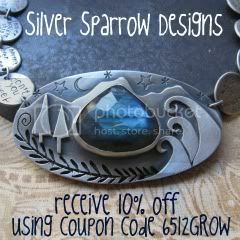 ps: Do you live in the Denver area? 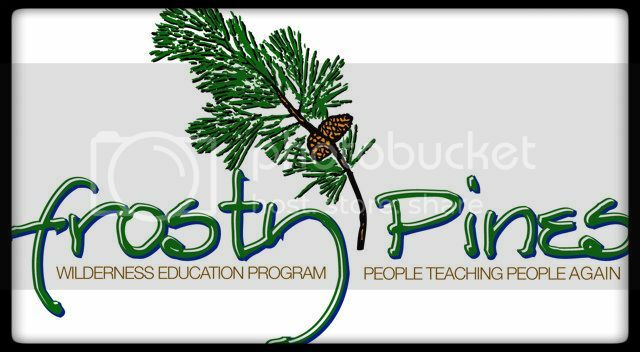 Remember how I’ve been excited about the Positive Discipline workshop occurring in Durango? This weekend there will be one (same instructors) in Denver. Dan and I were so inspired by this workshop; I received new language in which to view my children, effective and compassionate tools, and support to continue forward on the path to raise joyful and responsible children without threats, bribes or punishment. Go here for more info (click on orange “e” to sign up). Also, feel free to e-mail me if you have any questions. Strange, the URL was wrong on the email. Yeah, sorry bout that. still waiting for my fairyblogmother to land and help me switch over to a self-hosted site. It was wrong in my email as well. But nevertheless another wonderful morning read! The pears look delish! I’m going to have to try the oven route. It’s way to humid here to do any sort of sun drying. Heading over to look at the workshop you linked. Happy Thursday to you! Are in the Denver area? Wow. I cannot recommend these inspiring, kind, real teachers enough. I’ve totally been eyeing a pear tree…I’m getting up the nerve to ask her when I see her outside! yes! let me know what she says. Love the recipe. You are woman after my own heart. Love the preservation list. I am never never that organized! I’m commenting on the “comments closed” picture. Even after this many years (I’m holding up 7 fingers, yikes), I recognized that wonderful tree instantly. Thanks for sharing it. Your preservation chart is epic. My notes to myself are usually three dimensional clumps of hard paper, after they have been through the washer in the pocket of my pants. Sometimes twice. Sometimes, the pants come off the line with a strange wadded up little lump in the pocket, and I just can’t be bothered to remove it, Also, sometimes, it is a plum pit. I did remember that peach jam and applesauce were huge hits around here, and so make wholly unreasonable amounts of both, which will no doubt be gone by December. I only do a chart for the freezers. A nice spreadsheet in excel – my favorite program. That way it’s nice and neat for me to scribble all over, adding this, subtracting that. I really should do one for my canned goods and dried treats. 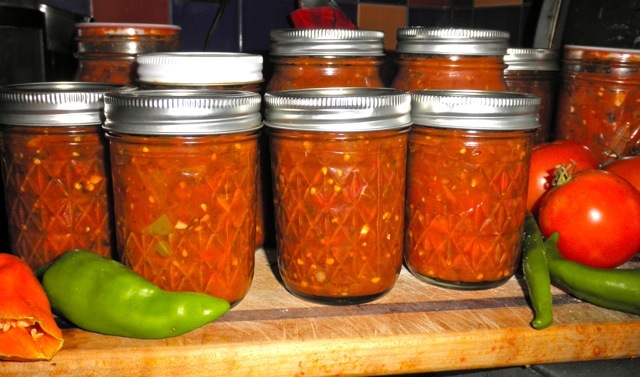 I’ve been given an absolute plethora of hot peppers this year – I’ve already made my chile mix for soups & sauces, I’ve got plenty to pickle, and now I’m getting ready to try fermenting some of them, as I hear fermented peppers make a great base for hot sauce. Your pear pictures could very well be my pepper pictures! MMMMMMmmmmm! Yummy-ness all around! I am SOOOO excited I am going to the positive parenting talk tonight!!!! YEAH!!! I was so jealous of hearing all your praise for these folks that I clicked on their link on your blog-page and low-and-behold they are in Denver! I invited about 15 of my other girlfriend/mommies. While my hubby is getting shloshed at The Great American Beer Fest (Ska is there), I will be learning about positive discipline for him, I mean for Owen, he, he, he. Love ya Rachel! Laura, I am so glad you’re going. KC and Kathleen are wonderful, wise, inspiring teachers. It’s a great investment in All your relationships. Big Love to you and that insanely adorable boy. 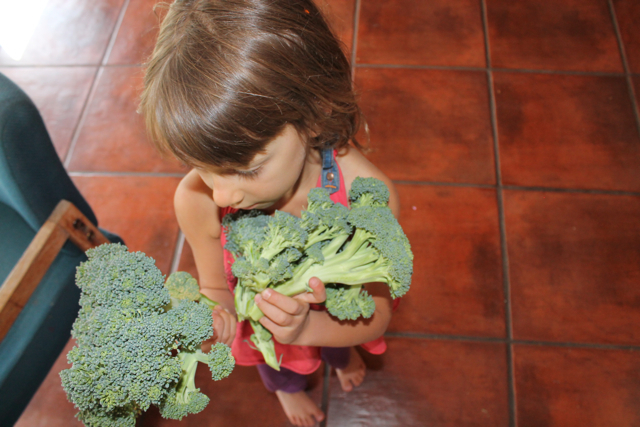 I am still LOVING that haircut of Rose’s- highlighted in the broccoli picture. She did a really good job. wow those pears look amazing. 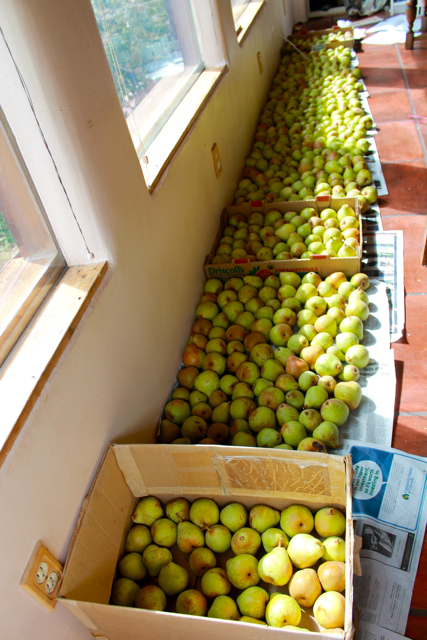 We’ve had hardly any apples on our trees this year so have been scrumping and foraging locally but there are no pear trees around…thank you for sharing this. Oh, I’m going to try this this afternoon, they look incredibel! My mother in law had a pear tree that the fruit was ready in august-september. Not really anything to peel just knots the size of large lemons. I have a cooking pear that are good now. I have 6 dogs and have suplemented their food with these pears for 3 months. They consider this the biggest treat! When they see the pears their faces get so exited and when their eating they act like they are savoring the flavor! so i was not really paying attention to what i was doing or i would surely not have made this mistake, but i kept wondering why i was going through so much of the spices (i tried chipotle chili powder/salt and cinnamon/salt) and after they dried i realized i was not supposed to dredge them through the spices and coat them, just sprinkle them. holy man. next batch i will get that right! i think i’m going to have to cook down the first batch into a dish, they are much too spicy. hehehe. luckily i still have another 70 pounds or so to go…. Hmm. Maybe incorporate into a chili sauce? I once made a apple-elk chili that was really good.